The CPO label from Germany are doing sterling work to promote the music of many European Romantic composers who although highly esteemed during their lifetimes have fallen out of vogue. The son of a schoolteacher, Kiel was born in 1821 at Puderbach situated in the Westerwald near Koblenz in Germany. Largely self-taught Kiel as a young boy received piano tuition from provincial teachers. Around 1835 he joined the ensemble of the Sayn-Wittgenstein-Berleburg court. Around 1838-39 he studied with court musician Caspar Kummer at Coburg and then in 1842 with the aid of a stipend from King Frederick William IV of Prussia he became the student of Siegfried Dehn in Berlin. Ensconced in Berlin, Kiel became a much-in-demand music teacher. In 1866 he was teaching at the Stern Conservatory; later elevated to a professorship. In 1869-70 he became a professor at the newly-founded Hochschule für Musik (Academy of Music) at Charlottenburg, Berlin. He was also a council member of the Berlin Academy of the Arts. Several of Kiel’s students went on to make considerable reputations for themselves in the music world including: Charles Villiers Stanford, Arthur Somervell, Frederic Cowen, Johan Gustav Sjögren and Ignacy Jan Paderewski. Musicologist Edward DannreutherB wrote in 1905 that Kiel was one of the adherents of the school of the Romantic master Robert Schumann; a group that included fellow composers: Robert Volkmann; Hermann Goetz; Theodor Kirchner and Adolf Jensen. He was held in high regard by his peers and the influential musicologist and critic Wilhelm Altmann wrote that, “throughout my long life, I have found Kiel’s chamber music a never-failing source of delight”. Kiel had a penchant for the piano and he included a piano part in twenty-seven of his scores. The three Piano Quartets were, it seems, composed in chronological order and published in 1867-68 by Simrock of Berlin. Although Kiel, “followed in the wake of Schumann”C and was a close contemporary of Brahms these chamber scores are heavily influenced by middle-period Beethoven at a time that encompassed several of the master's great chamber works such as the: 6 ‘Lobkowitz’ Quartets, Op. 18; the 3 ‘Rasoumovsky’ Quartets , Op. 59; 2 Piano Trios, Op. 70; the Quartet in E flat major, Op. 74 ‘Harp’; Quartet in F minor, Op.95 ‘Serious’ and the Piano Trio in B flat major, Op. 97 ‘Archduke’. 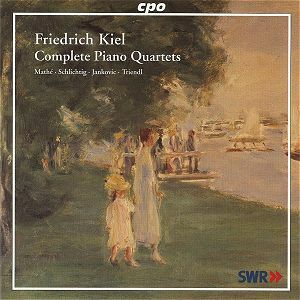 Even though Kiel’s these piano quartets look back to Beethoven I hope that now, well over a century later, we are able to re-evaluate Kiel’s compositions for their intrinsic appeal and quality rather than for the dynamic of the era in which they were written. Kiel’s four-movement Piano Quartet No. 1 was printed in 1867 during a happy time in his personal life following his appointment at the Stern Conservatory. According to music writer Hartmut Wecker, “the A minor Quartet seems to have been Kiel’s most successful and most famous such work.” The substantial opening movement Allegro moderato con spirito is given a spiritedly brisk performance by the players. Running through the movement are two variegated sections at 3:21-5:04 and 6:35-9:35 that contain undercurrents of sadness and discontent. The second movement Adagio con moto conveys tenderness and lyricism in profusion and the somewhat edgy Scherzo movement rather canters along. Joyous and vivacious playing in the final movement marked Vivace that contains an endearing Beethoven-like theme at 0:48-1:29, 2:51-3:32 and 6:28-7:10. After hearing this splendid performance one wonders why the score does not receive the occasional outing at chamber recitals. The Piano Quartet No. 2 Op. 44 is also cast in four movements. Hartmut Wecker considered it “… merrier and more melodic than its sister work in A minor.” In the extended opening movement the players contrast a yearning reflectiveness with an abundance of restless energy. The following Intermezzo is brooding nervousness with episodes of gentle repose. The dark storm-clouds of the Largo convey an intense and heavy sadness. The concluding movement is a bright and capricious Rondo with a brilliant Presto stretta ending. Following a three movement design the Piano Quartet No. 3, Op. 50 was printed in 1868, a year later than the A minor and E major scores. The opening movement, an Allegro moderato is permeated with pessimistic and melancholy utterances. One notices the use of a brighter dance-like theme that is first heard at 1:29 and again at 2:40. The players in the central movement Andante bring out a convincing hymn-like quality. There are two variegated sections. The first at 1:29-2:25 is relaxed, containing an almost oriental flavour and the second at 2:45-4:03 has a brisker more energetic character. The final movement marked Presto assai trips along with an ebullient gaiety to provide a satisfying conclusion to the score. I found the booklet essay by Harmut Wecker a most useful point of reference and it certainly enhances this CPO disc. The track-listing of the final work on the disc the Piano Quartet No. 3 in G major, Op. 50 is incorrectly numbered. The recording was made in 2005 at the SWR Studio in Karlsruhe. Piano and strings is a notoriously difficult combination to balance and the Op. 45 work sounded slightly over-bright in the forte passages. Otherwise the remaining two works are clear and well balanced. Providing unity and assurance the players communicate a clear affection for Kiel’s music. At the keyboard Oliver Triendl plays with freshness and vitality producing a wide range of colour. I was struck by the exemplary intonation and pleasing timbre from the string trio. These high quality performances make a splendid case for a reassessment of the music of Friedrich Kiel. Those who have a fondness for Romantic chamber music should not hesitate. One looks forward to more recordings of Kiel’s chamber works and also of his sacred choral music. A Letter from Liszt to Otto Lessmann dated Weimar, 24 September 1873. B Oxford History of Music, Vol. VI, ‘The Romantic Period’ by Edward Dannreuther. Publisher: Clarendon Press, Oxford (1905). Pg 289. C ‘The Romantic Leaders’ article ‘From Beethoven to Brahms’ section of the chapter ‘Chamber Music’ by Edwin Evans. Contained in The Musical Companion, edited by A. L. Bacharach published by Victor Gollancz Ltd. London (first published 1934). Pg 519.